Viajante was a fine dining restaurant in Bethnal Green, run by Portuguese chef Nuno Mendes. It closed at the end of February 2014. A fine dining restaurant in Bethnal Green, run by Portuguese chef Nuno Mendes (latterly the head chef at Bacchus in Hoxton). The building, first of all, is impressive. 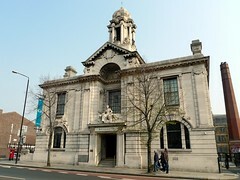 It's a former town hall with the main entrance on Cambridge Heath Road (just near Cambridge Heath Station) which has been converted to a hotel (the Town Hall Hotel), and Nuno Mendes's restaurant takes pride of place. Upon entering, there is a lobby where they will take your coat and direct you to your table if you're dining. A comfortable and fairly capacious bar is to the right, where the day's newspapers as well as a selection of magazines are laid out by the door for guests. A range of stools along the central island bar, as well as tables and couches allow both those waiting for a table and those just there for a drink, to spread out. A short bar menu is available, as well as a selection of cocktails photo of Osaka punch cocktail and other drinks. To the left of the lobby is the restaurant, which has two rooms. At the front of the building is the main dining room, where the kitchen is located by the windows overlooking Cambridge Heath Road. The final plating and preparation of the dishes takes place here, in full view of the diners in the room. There is a second dining room to the rear of the building, as well as a separate private dining room for larger groups. Decor is understated, as you'd expect from this level of restaurant, but chairs are comfortable and tables are large and well-spaced. Service is particularly good: food and wine are presented promptly, glasses are never allowed to get empty, and it's easy to get attention, but equally there is no sense of staff hovering about. The first thing to note is that the menu is tasting only and the choice is from 3 and 6 courses at lunch (£28 and £50 respectively), or 6 courses at dinner (£65). One can have a 9-course lunch (£65) or a 12-course dinner (£90), but this must be advised in advance photo of menu in March 2011. Guests are requested if they have any food or dietary requirements and then the kitchen team sets to work. Vegetarian food was not a problem, and the full menu is not revealed until after the meal, where they have copies of the food menu to take away photo of tasting menu in March 2011. The wine list is fairly short photo of page 1 of wine menu, laid out over a few pages in the middle of a random book they have stacked up by the side of the room, but wine matchings are available at a reasonable price. The first starter was squid in ink with pickled radishes and sea lettuce photo, the squid hidden under the foliage, but cooked to a really enjoyable consistency (silky in texture, and not chewy or tough at all). This was followed by salsify in milk with brown butter and truffle, and served with a beef jelly photo, which despite my trepidation about the jelly, turned out to be a fine dish. The king crab with charred leeks, milk skin and ash emulsion photo maintained the quality, exceeded only by the next course, duck heart and tongues with celeriac and pine photo, the meat beautifully tender. A restrained main course of lamb saddle and belly with wild garlic and cereals photo may have been a nod to the traditional Sunday roast, but the lamb was among the finest I've tasted, and this was definitely one of my highlights of the meal. For a pre-dessert, a pannacotta icecream with apple and shiso photo was wonderfully balanced, though I wasn't won over by the subsequent parsnips and milk served with tapioca photo. Following the meal, petit fours were served, both a shot of cream catalan photo and a selection of truffles photo. Ewan's verdict: In total, an excellent meal. Every course, either through choice of ingredients or preparation and presentation, provided something of interest and a few of them were the equal of anything I've eaten at a restaurant. I would happily return again. Last visited by Ewan, Kerry and friends, March 2011. Last edited 2017-06-11 19:41:56 (version 15; diff). List all versions. Page last edited 2017-06-11 19:41:56 (version 15).